The goal of life is self-knowledge. If you have infirmities, helplessness, ill-health, worries, blocks or hang-ups, don’t worry. That is the Vedantic promise. Don’t fight with those things—just go within. See what is the Source of all this. Your mind is yours. You have created it; that is your expression, your projection, your shadow. You have to learn the technique or the tact how to solve that problem of mind. 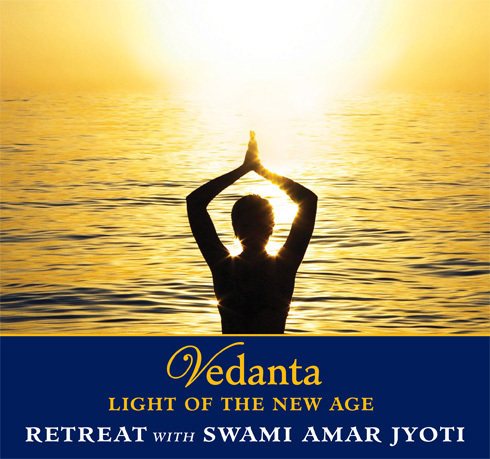 In this retreat given in 1986, Swami Amar Jyoti reveals the path of Vedanta, which has been called the ultimate knowledge. Drawing upon teachings and stories from the Upanishads, He explains this nondual philosophy as a diamond-like spiritual wealth that awakens us to our Divinity. Freedom from suffering is Vedanta’s great promise, as demonstrated in the life of the Buddha. All conceptions are superimpositions upon Reality, illusory dreams only—Vedantic meditation dissolves this basic illusion. The cosmic mystery of Divine Mother—Shakti, Maya, the primordial Energy—is elucidated, and love as the basis and purpose of creation. In today’s world, Vedanta is a bridge between science and spirituality, erasing the false distinction between the individual and the Unlimited.